Crispy potato tacos, known in Spanish as “Taquitos Dorados de Papa”, is one of the most popular dishes that are loved by young and old. You don’t need many ingredients to make them, and they can even be prepared ahead of time and reheated the oven. They’re usually eaten for dinner time and are a very popular meal during the lent time when some families restrain from eating meat. Lent time in Mexico is observed right after Mardi grass and Ash Wednesday have passed. During the following Fridays, and up until Easter Sunday, people will eat fish, seafood, legumes, and vegetable dishes. Cooks get creative preparing meatless dishes, and these crispy potato tacos (as well as potato patties) are some of those many dishes we enjoy during this season. I know that many of my readers, like myself, will have fond memories of their mom or grandma making “taquitos de papa”, either folded or rolled tortillas filled with the creaminess of the potatoes. Do you remember those times? When couldn’t you wait for the tacos to cool down just a little to take the first bite? I hope you make this recipe and also enjoy the power of potatoes, which are rich in potassium, vitamin C, vitamin B6, and iron. Season potatoes with salt and pepper, and mash until you have a smooth paste. It won’t look exactly like a puree, but more like a potato paste. Set aside. Heat about ½ cup of oil in a large skillet over medium-high heat. Adding the rest of the oil as needed. While you are waiting for the oil to heat, slightly warm the tortillas one by one in a hot griddle, in order to make them more pliable. Cover them with a kitchen napkin. Now, add about 2 tablespoons of the mashed potatoes over half of each tortilla and fold. Secure the sides of the tortilla with two toothpicks. Sometimes, I don’t use the toothpicks, but that requires some skill of firmly pressing down the edges while frying; if this is your first time making them, and to be on the safe side, use the toothpicks. Place the folded taco into the hot oil, and cook for about one and half minutes per side, until golden brown and crispy. Since you will be working in batches, have a large plate ready and covered with paper towels to absorb the excess oil. Repeat the process until you finish cooking all the tacos. Mix the salsa ingredients in a medium-size bowl and season with salt. Set aside. You can have all the ingredients ready a day in advance and just combine before serving. 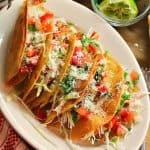 To serve your potato tacos, remove the toothpicks and garnish with the shredded cabbage, cotija cheese, and Pico de Gallo salsa. Avocado and cream are also added as toppings. Crispy potato tacos, known in Spanish as “Taquitos Dorados de Papa”, is one of the most popular dishes that are loved by young and old. Place whole potatoes in a medium-size saucepan and cover with cold water. DO NOT peel or cut the potatoes. We don’t want the potatoes to absorb too much water because then that water will be released in the form of bubbles during the frying process and the oil will splatter. Turn heat to medium-high and cook until tender (about 20 to 25 minutes). Drain potatoes and move to a bowl. Wait until they’re cool enough to handle and discard their skins. Place the folded taco into the hot oil, and cook for about one and half minutes per side, until golden brown and crispy. 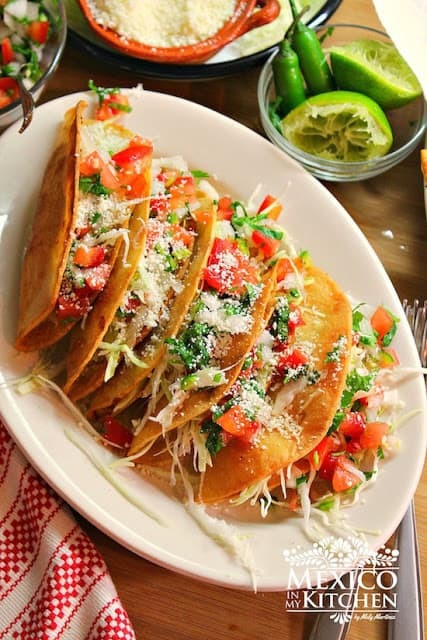 Since you will be working in batches to make your potato tacos, have a large plate ready and covered with paper towels to absorb the excess oil. Repeat the process until you finish cooking all the tacos. To serve, remove the toothpicks (very carefully to avoid breaking the tortillas) and garnish with the shredded cabbage, cotija cheese, and Pico de Gallo salsa. Avocado and cream are also added as toppings. · You can use any other type of potato for this recipe. · If you don’t find Mexican Cotija cheese or Queso Fresco, substitute with parmesan or dried feta cheese. · This recipe usually doesn’t have any other seasoning added to the potatoes, just a little bit of salt and pepper is enough to enjoy the full flavors of the potatoes. Kids love this combo of a crunchy taco and potatoes! Thank you fro stopping by. Nice to hear about you, and indeed these are some really good tacos! This is a great way to enjoy an authentic taco. Love it! Thank you for trying the recipes. Happy cooking! I made this for dinner and it was delicious. I only used the toothpicks on a couple of the tacos. I didn't need them. I will make these again. Thanks Mely for sharing and providing helpful photos. Thank you for trying the recipe. I'm so glad you like them. I love everything about this! Completely different than the usual taco, I'm going to HAVE to make this. Grrrr, I forgot to put my Cojita on them… now they're all gone! We have always made these but we actually smash cotija cheese in the potatoes and garlic powder or onion powder. When cooked we also top with sour cream and all the veggies you have there alonv with some avocado. Its so good! Yum! We mix a melty cheese in with the papas and top with crema, along with the rest of the toppings. And we include the cabbage in the pico de gallo so that it gets marinated with the limon. Great to here we are not the only ones mixing the cabbage with the pico de gallo. Love the idea of adding cheese! 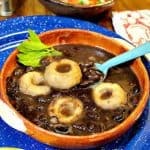 I really like this recipe because we are vegetarian, so i cannot wait to try this!! Thank you for sharing. Also, as we really do not eat many fried foods, would you be so kind as to suggest how i can crisp these up in the oven and at what temperature. Thank you in advance for your help..
Usually, for roasting veggies in the oven, drizzle a little bit of olive oil and heat oven at 400F, the time will depend on each vegetable type and the size you cut them. Ah, one of my all time favorites! This was in our Friday Lenten rotation, as a kid. My mom also added grated cheese to the potatoes. The cheese would melt into the potato mixture. The BEST! Thanks for reminding me of the power of simple cooking!